If you have small children in your house, you know it is only a matter of minutes before a clean house is covered in toys and the big clean up job is coming… for the 10th time today. With an almost 2 year old, it is instant. And her toys are a lot bulkier than a lot of bigger kid toys can be. One day there will likely be Barbies and accessories everywhere and Lego rather than the big chunky Duplo style blocks we have now. 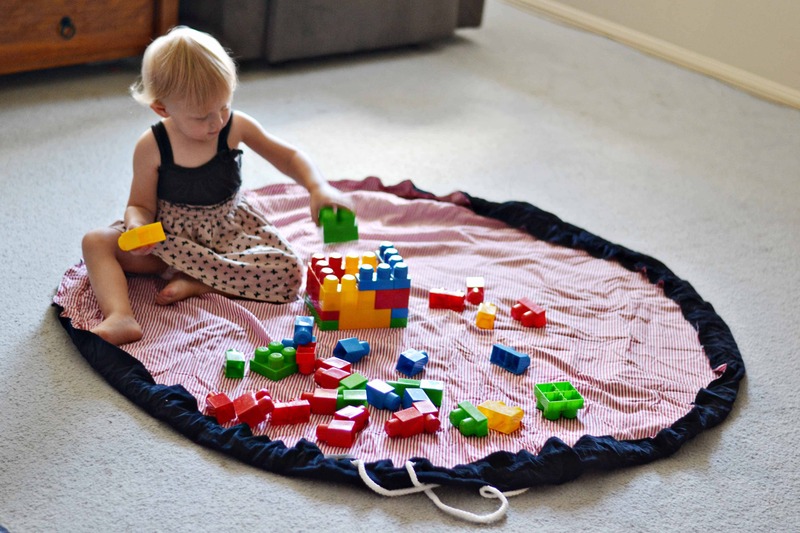 I was lucky enough to receive one of the fabulous Play N Wrap hobby mats to trial and it is genius! Suddenly clean up time is reduced to almost nothing. What I was most impressed about was the tough sturdy material that makes it heavy duty and strong enough to carry a heavy load of toys like a massive pile of Lego or toy cars. It is made of navy blue corduroy and red and white striped cotton. 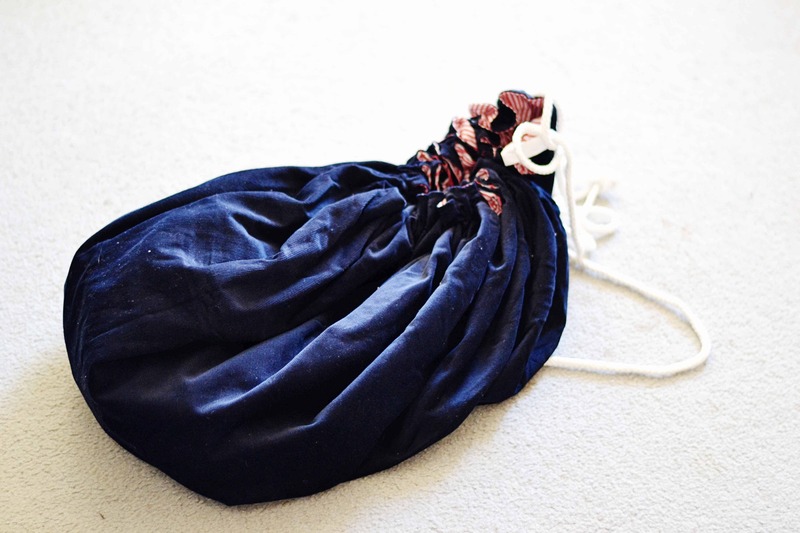 It has a thick drawstring to carry the hobby mat with once it is pulled together. And spread out, the mat is a great size at 1.4 metres. 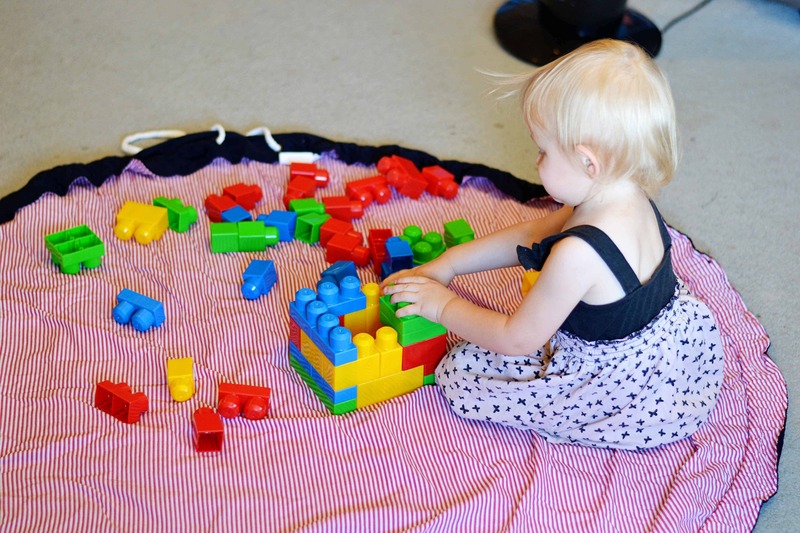 Then in less than a minute, the blocks were all packed up and my lounge room floor was no longer a war zone risking pain from stepping on randomly thrown blocks and other various landmines known as children toys. Plus the Hobby Mat also comes packaged in the box below which I think looks great and makes it just perfect for a present for a birthday or even getting in early for a baby shower for friends or family. You can save your loved ones some time by giving them this quick toy clean up system. What I also love other than the speedy clean up is the fact that you can use it to travel too. Maybe you are heading on holidays. Pack the kids favourite toys in the Hobby Mat, throw it in the car and unwrap it at your destination. So easy. Or even for a quick trip to grandma’s, or if your little ones want to go play outside and get some fresh air. The options are pretty endless. This is a fantastic product of high quality and convenience. You can grab one for yourself over at Play N Wrap right now. The RRP is $45 which is a great price for such a versatile product. They are also available at several stores around Australia and the stockists are on the website.